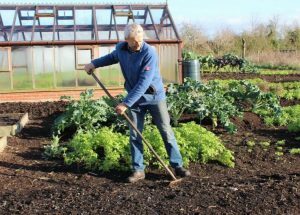 There has been a recent spate of organised thefts and vandalism on allotment sites across Oxford. It can be found on the Resources for Members page. 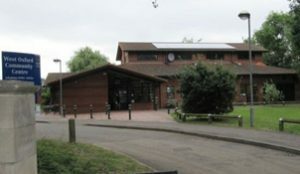 The 2019 AGM will take place at West Oxford Community Centre (next to Twenty Pound Meadow) in the evening of Thursday 25th April. 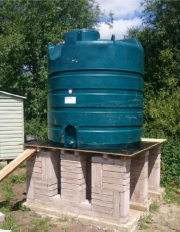 As part of the project we plan to extend the rainfall collecting area of the allotment shop roof and need volunteers, preferably with building or good DIY experience, to take on this subproject. 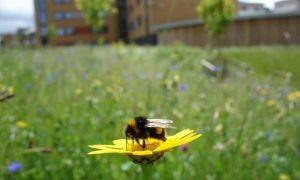 A recent article in the Guardian reports that allotments, weedy corners and fancy gardens are all urban havens for bees and other pollinators, a study has found. The research, published in the journal Nature Ecology and Evolution, found allotments often had 10 times more bees than parks, cemeteries and urban nature reserves. 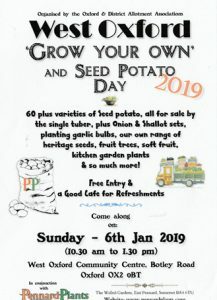 Following the success of our Potato Fair earlier this ye ar, ODFAA have organised a repeat in January 2019. This is an excellent opportunity to try out different potato varieties as they can be bought by the tuber. This summer Botley Meadow conducted a trial of several varieties purchased at the potato fair – to see which ones grew best in the local soil. The Fair will be held on Sunday 6th January in the large hall at WOCA from 10.30 am to 1.30pm. UPDATE: Check out the results from the Botley Meadow Potato Trial using tubers bought at the 2018 Potato Fair. Want to grow tender seedl ings or heat-loving crops but don’t have a greenhouse? No problem! 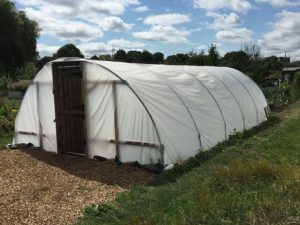 Why not rent one of the spaces in our new communal polytunnel? Speak to Nick (49), Pól (50), Phil (21a) or Glenn (59) – all on Botley Meadow – for further details. Warm spells are becoming much more prolonged. From 1961 to 1990, the average longest warm spell each year was 5.3 days. From 2008 to 2017 this more than doubled to 13.2 days. This year, which is not included in these statistics, was even longer at 17 days. Notably, the south-east has seen an especially striking increase over the same period, up from an average of 6.1 days to 18.3 days. While the temperature on the hottest day of the year has risen roughly in line with the average annual rate of warming since 1961, the coldest day has warmed at twice that rate. In the 30 years until 1990, the bitterest winter night in the UK averaged -8.5C. From 2008 to 2017 it was -6.8C. The metric of “icing days”, which shows the average number of days each year with freezing temperatures, has fallen from 4.8 to 3.2. 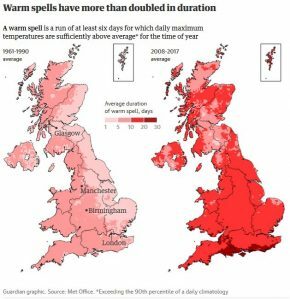 In the south-east last year there was not a single day averaging below 0C. More details and booking form here. 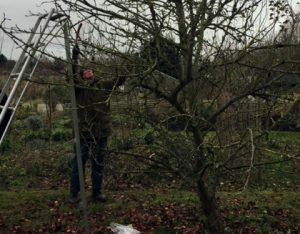 Following the success of the last course we organised, on Saturday, 2 December, from 9.00 to 1.00, a tree pruning expert from Waterperry Gardens will be offering a course on pruning fruit trees. It will start with a one-hour session at the Community Centre, followed by three hours of instruction and practice on the allotment. This will take place at the north-west corner of Twenty Pound Meadow (the Tumbling Bay end) next to the bonfire site location where there are a number of mature apple trees that need pruning. All the pruning practice will take place there, not on other allotments. Chris Lanczak is manager of the orchard and chief gardener at Waterperry Gardens – for more information see this article from the Oxford Times. The course will cost £10.00. You’ll need to register for the course because the number of participants is limited to 20. If you wish to register, contact Gus Fagan (gus.fagan@ntlworld.com). Once your registration has been accepted, you need to pay in advance in the shop. If you have not paid then we reserve the right to offer your place to those on a waiting list. On the day, you will need a good sharp pruning shears, pruning saw, or lopper. You will also need a good pair of gloves. All pruning will be done from the ground – no ladders. You can pay your rent at the Association shop (on the Twenty Pound Meadow site) between 10am and 12pm on the first three Sundays in September – 2nd, 9th or 16th. A full plot costs £25 for the 2018-19 and a half plot costs £12.50. 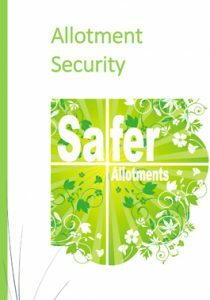 Cheques can be accepted and should be made payable to: Osney St Thomas & New Botley Allotments Association. Please remember to pay your rent on time as if the Committee have to chase people for rent it becomes very time-consuming. Indeed the rules allow the Committee to charge late payment fines and we are actively considering this as an option. We strongly encourage you to pay your rent in person so that if there is anything we need to discuss with you concerning your plot we have the opportunity to do so If you cannot make any of the available dates then please make alternative arrangements or contact one of the Committee members.